As I noted yesterday with regards to the passing of Joe Cocker, I haven’t spent much time this year thinking about cover versions of Bob Dylan. A couple of blog posts, but that’s about it. I could probably write for another whole year on the subject of Dylan covers, but I’m not going to do that. 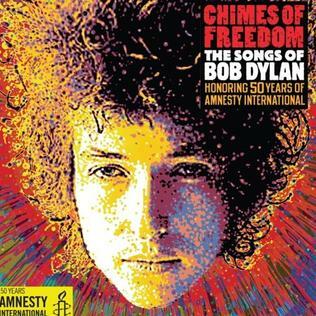 I initially thought that I would skip the quadruple Dylan covers album Chimes of Freedom: The Songs of Bob Dylan Honoring Fifty Years of Amnesty International that was released in January 2012 except to note that they use his version of the title track as the last song. But you know how it goes, and I turned the album on while doing Christmas wrapping and wound up listening to the whole thing. In a nutshell: It’s pretty bad. Here’s the problem. 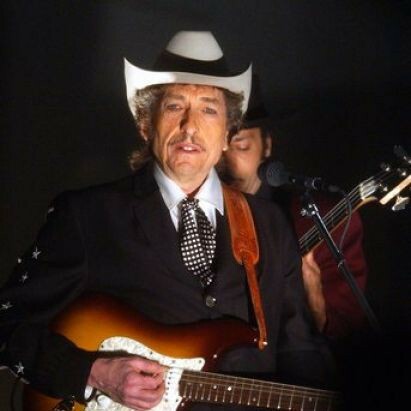 More than any other singer, Bob Dylan is the best re-inventor of his own music. The process is constant – there is always a newer version of a song coming around in his live performances. Tempos change, keys change, even lyrics change. With certain Dylan songs you can get the sense that he’s performed it dozens of different ways. That doesn’t leave a lot of room for others to come in and “make the song their own”. Sure, there are artists who have done Dylan better than Dylan (Jimi Hendrix, Joan Baez), but that seems to come from a place of deep understanding of the songs. A quadruple CD like this, on the other hand, seems to have attracted a lot of limp versions. I’m not going to name names of poor performances, but there are a number of people here who seem to just want to mimic Dylan (Mick Hucknell, sorry can’t help naming him). Sometimes mimickry works out just fine (Jackson Browne’s “Love Minus Zero/No Limit”), but usually it is just a waste of time. There are a lot of bands here who want to layer on loud guitars and shout some angry Dylan lyrics (Rise Against, Bad Religion, My Chemical Romance, State Radio), and the idea of listening to an epic version of Dave Matthews Band singing “Knockin’ On Heaven’s Door” was more than I could bear. So much of the album is just bland and not worth hearing (including a few true disappointments from people I otherwise generally always like, including Lucinda Williams and Kris Kristofferson). Here are the ten best contributions in descending order. 10. Thea Gilmore “I’ll Remember You”. I will admit that I wasn’t aware of Gilmore before hearing this, but quick research showed me that Joan Baez personally asked her to be the opening act on one of her tours. That makes perfect sense. This is a very traditional British folk version of this song, but it is beautifully sung. I’ll look Gilmore up when this project is finished. 9. Michael Franti “Subterranean Homesick Blues”. Franti is someone who I was once a big fan of but haven’t followed in literally forever. I owned everything by the Beatnigs and by Disposable Heroes of Hiphoprisy, but sort of bailed out around the Spearhead period. This is a lively, fun version of this song that reminded me why I used to like this guy. He just sort of funks this one up, which is all it really needed. 8. Billy Bragg “Lay Down Your Weary Tune”. Dylan wrote this in 1963 but left it off The Times They Are a-Changin’ (it surfaced twenty years later on Biograph). This is a pretty straightforward version of this, and Bragg owes almost everything he is to the influence of Dylan, but it is the best version of someone other than Dylan doing the Dylan version of the song on the whole album. 7. Sinead O’Connor “Property of Jesus”. Weird one. O’Connor’s voice is filtered here so as to make it sound like it is behind the instrumentation – like she’s singing through a megaphone – and she hollers a lot of the lyrics, even though her vision isn’t all that angry (by O’Connor standards, at least). Still, it’s an interesting take and moreover, credit to Sinead for picking an obscure Dylan song that fits her perfectly. She’s been through an awful lot in her life, but this expression of faith is fascinating. 6. Miley Cyrus “You’re Gonna Make Me Lonesome When You Go”. Yeah, it surprised me too. I didn’t know what I was listening to when I looked up to find out that it was pre-twerking Cyrus. I can identify exactly no other Miley Cyrus songs, but I wasn’t aware that she had such a good voice. I look forward to listening to the mature Miley Cyrus covering Loretta Lynn songs about thirty years from now. 5. Dierks Bentley “Senor (Tales of Yankee Power)”. I don’t listen to a lot of contemporary country, so I was unaware of Dierks Bentley, but now I’m interested in him. This is a lovely bluegrass version of this with plenty of fiddle and banjo, and Bentley finds a new way to sing this. Another discovery. 4. Kesha “Don’t Think Twice, It’s Alright”. This is not the most unusual version of a Dylan song on this album (indeed, the very next track is Kronos Quartet doing this exact same song) but it is by far the most successfully innovative take. Kesha is someone like Cyrus that I don’t pay any attention to, but I really appreciated this version. 3. Patti Smith “Drifter’s Escape”. Smith just gets it. She made “Dark Eyes” a better song than Dylan did, and here she takes another obscurity and breathes life into it. What can you say about Patti Smith that hasn’t been said? I should spend a year blogging about her – I’d get a nice break in the middle of the year! 2. Carolina Chocolate Drops “Political World”. I adore the Carolina Chocolate Drops – so much great banjo! – and this is a fun version of this song. They have totally remade it, and they get huge bonus marks not only for using an obscure Dylan song, but for redeeming one of his songs that I don’t really care all that much for. On most albums this would be the best thing going, if it just wasn’t for…. 1. Joan Baez “Seven Curses”. This is astounding. Baez’s beautiful, haunting version of this Dylan rarity makes it sound like it is three hundred years old. Dylan wrote this in 1963 but didn’t use (it shows up on the first Bootleg Series) during a period where he was still very self-consciously borrowing from the templates of older folk traditions. He was trying to write an “old” folk song and I didn’t think he really succeeded until hearing this. The song is about a horse rustler who is condemned to hanging and whose daughter offers herself to the judge to spare his life. It all goes horribly wrong. Baez makes it sound like a regional folk tune that is vastly older than its fifty years. Her guitar playing is exquisite, and her voice has always been so. What this album drove home for me wasn’t just that a lot of people are terrible at covering Dylan (Seal and Jeff Beck duet on “Like a Rolling Stone” and it is horrible) but, once again, the importance of Joan Baez in the life and career of Bob Dylan. I have no idea what their relationship might be these days – do they exchange holiday cards? – but I really hope that they have a relationship. They are two sides of the same coin, and “Seven Curses” proves it once again.